Mattel CEO Margo Georgiadis, who took the top spot at the struggling toymaker a little more than a year ago, is already leaving the company. Georgiadis will be replaced by Ynon Kreiz, a Mattel director. Kreiz will also soon replace former Mattel CEO Christopher Sinclair as the company's chairman. Kreiz will take over on April 26, the day Mattel will report its latest quarterly results. Mattel said Georgiadis will stay with the company in an advisory role until May 10. Georgiadis came to Mattel from Google (GOOGL) and is leaving Mattel to become the CEO of the venture capital-backed genealogy company Ancestry. After Georgiadis leaves, there will be only 23 women running Fortune 500 companies. Meg Whitman of HP Enterprise (HPE), Shira Goodman of Staples and Avon's (AVP) Sheri McCoy all announced their departures in recent months. Shares of Mattel (MAT) fell 3% in regular trading Thursday but rallied after hours. That could be a possible sign that investors believe Kreiz may be amenable to a possible merger with Mattel rival Hasbro (HAS). Hasbro and Mattel are both struggling as kids play more games on smartphones and tablets and with other high-tech toys. The demise of Toys "R" Us has also hurt sales for both companies, as has the increased clout of Amazon (AMZN), Walmart (WMT) and Target (TGT) -- which all focus on low prices -- in the toy retail industry. But Mattel is hurting even more than Hasbro. Its stock has lost nearly half its value in the past year as sales of Barbie, Hot Wheels. American Girl and Fisher-Price toys have underwhelmed. Hasbro, on the other hand, has only fallen about 12% in the past year. It is still benefiting from the fact that it now has most of the major toy licenses tied to Disney (DIS) franchises such as the Princess line of characters, Frozen, Star Wars and Marvel comics. But neither company is doing well exactly. Hasbro is expected to report a year-over-year sales drop of nearly 4% and earnings-per-share decline of more than 35% when it reports its latest results before the market opens this coming Monday. Wall Street is forecasting a 5% sales decrease for Mattel and a wider loss than a year ago. 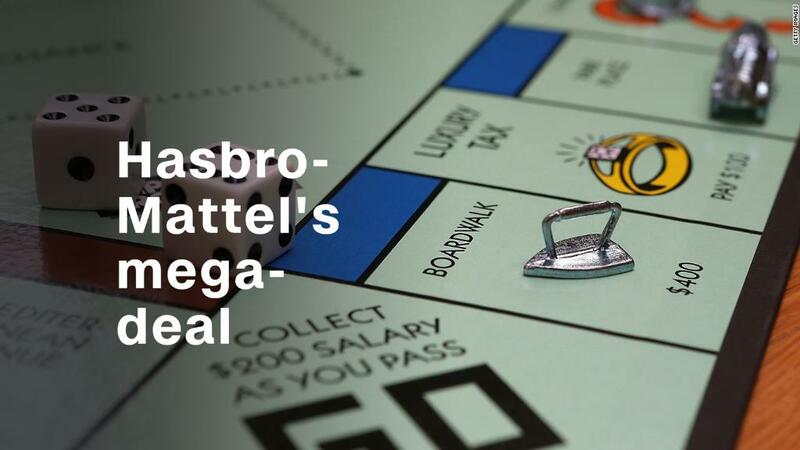 Analysts may question Hasbro and Mattel executives about whether an acquisition might be back on the table during the companies' earnings conference calls next week. Kreiz, the new Mattel CEO, could also be asked about whether a deal with a media company would make sense. After all, there were rumors of a Hasbro-DreamWorks Animation merger in 2014. NBCUniversal owner Comcast (CMCSA) eventually bought DreamWorks Animation for $3.8 billion in 2016. What's more, Kreiz has a long background as a media executive. He was previously the head of Fox Kids Europe, the CEO and chairman of production company Endemol and also led Maker Studios, a production company bought by Disney in 2014.